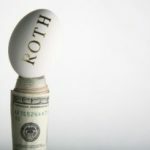 As a followup to my post earlier this week on Roth IRA income limits, I wanted to highlight how we typically make our Roth IRA contributions. For background, we’re in a relatively high (and variable) income tax bracket. Because of this, we flirt with the Roth income limits on an annual basis, and it’s hard to know for certain whether we’ll be above or below the line until late in the year. While we could wait until the end of the year, or even early the following year, to determine whether or not we can contribute, I’d rather get it knocked out right away. Thus, we make what others have termed “backdoor” Roth IRA contributions. For background, the income limits for converting from a traditional IRA to a Roth IRA went away back in 2010. Beyond this, there are no income limits for contributing to a traditional IRA. Yes, there are income limits for determining whether or not you can deduct your traditional IRA contributions, but you’re free to contribute no matter how much you make. For starters, you’ll need to make your traditional IRA contribution. There are a variety of ways to do this, with the easiest be funding your IRA from a linked bank account. For now, I’ll assume that you’ve already done this. Once your traditional IRA fund are in place, simply log in and select “Exchange (Sell funds to buy funds)” option from the “Transact on this account” pulldown menu. When asked what you want to sell, choose the traditional IRA holding(s) that you wish to convert out of. When asked what you want to buy, choose the Roth IRA holding(s) that you wish to convert into. Assuming that you made a non-deductible contribution, that you don’t have any untaxed gains in the account you’re converting, and that you don’t have any other non-Roth IRA IRA accounts in your name, however, there will be no tax liability*. It will be as if you had contributed directly to the Roth IRA in the first place, except you’ll have circumvented the income limits. Given the above, I selected the “Do Not Withhold” option when asked about tax withholding and then submitted the order. That’s it. 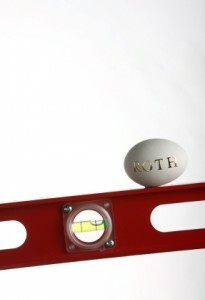 We’ve now fully funded our Roth IRAs for 2012 and don’t have to think about whether or not we’ll finish above/below the income limits. *Note: If you have previously made tax-deductible contributions to a non-Roth IRA, even if they’re in a different account, making a conversion like this will generate a tax liability. The reason for this is that the IRS views all of your IRAs as one big pot of money, and they don’t let you pick and choose which dollars you convert. The good news is that money in “qualified” plans, such as 401(k) or 403(b) plans, is not included in the tax calculation, so you could conceivably move all of your pre-tax money into a Solo 401(k) to effectively hide it before doing the “contribute and convert” thing. Hi, would love to get a clarification on a conversion issue. I have one Traditional IRA funded completely with non-deductible contributions. The amount of the contributions significantly outweigh the amount of earnings, so I would like to convert the account to a Roth. This is not a back door Roth. This is a front door Roth, lol. 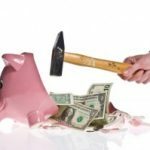 I understand that ordinary income tax will be levied on the earnings, so it is possible to split it – to roll the contributions to a Roth and the earnings to a 401K account? I may be dreaming, I realize. As mentioned, I have no other TIRA accounts and only one Roth, currently. Thank you. The current IRA contribution limit (for 2013) is $5500. This is for traditional and Roth contributions combined. Just would like to clarify that there’s still a limit on how much you can contribute to your traditional IRA, correct? For example, for 2013, it’s $5,500. In late Dec 2011, I funded a Roth IRA with $5,000. Today, I started my taxes in TurboTax and it states that I over Funded my Roth IRA by $590. How do I now remove that $590 and avoid a penalty? 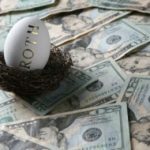 As of today the Roth IRA has grown 8%. @John, I wondered the same thing and found that after 5 years OR if you’re older than 59 1/2, there is no penalty to withdraw the initial conversion amount. There is a lot more detail here (http://www.totalmerrill.com/TotalMerrill/pages/ArticleViewer.aspx?TITLE=rothiraconversion&referrer=) on distribution rules and the order in which money is distributed from a Roth. Scroll down to the heading that reads – WHAT ARE THE ROTH IRA DISTRIBUTION RULES. Good luck. Also, to answer my own question above, you can contribute to 2011 (before April 17, 2012) and 2012 Traditional IRAs and convert both to Roths in the same calendar year. Thanks again Nickel for this article. I have a question about converted Roth IRA funds. Right now I’m trying to save up for a farmland purchase from my grandfather’s estate. The property will be available for sale in ~5 years. If I convert traditional, deducted IRA funds to Roth IRA funds and then pay taxes on it, can I then withdraw the taxed contributions at a later time in order to purchase the investment property? I would not be withdrawing earnings, only the initial contribution. I have looked at a self-directed IRA as a possibility in order to purchase the land within my IRA. The problem is that there are very strict personal use and close relative use laws. I plan to rent the land to my father or brother to farm, and this opens the possibility of disqualifying the IRA. I would then have to pay taxes and penalties immediately. Since there are other tax breaks associated with farmland, the risk and complexity of the IRA is not worth it. Thanks for your reply Nickel. I’ll check with Vanguard – I’m also a huge fan and have most everything with them. Also agree that one transaction is cleaner. Your follow up comment brings up a question, though. The deadline for a 2011 IRA contribution is April 17, 2012, correct? If so, can I contribute for 2011 AND 2012 now and convert both? I remember in 2010, the conversion deadline for the year was December 31, but does it really matter which year you’re doing the conversion? I feel like I must be forgetting/missing something. CF: Yes, I contribute into the Prime Money Market in my traditional and then convert into the Roth (into my preferred investment there) the next day. Sometimes there will be a few cents of earnings that will be taxable, but this time around the Prime MM rate is so low that I don’t think there will be any dividends. It’s not a big deal if you do have some earnings that end up being taxable. It’s just a few cents, and it’s money that you really did earn, so it stands to reason that you’d have to report it. As for your other question, if it were me, I would probably hold the money in a dedicated account and do it all at once simply because that would be a bit of a “cleaner” solution. I’m not sure what the ramifications of multiple conversions would be, but at the very least you’d have more to keep track of and there might be more reporting at the end of the year. As for IRA >>> 401(k) transfers, I stopped keeping track so I’m not sure if Vanguard has changed their policy. If you’ve read through the archives, you’ll know that I had to transfer from Vanguard to Fidelity to get it into the 401(k) and then transfer the 401(k) back to Vanguard (since I prefer Vanguard funds). If I understand your post correctly, you contribute the total amount for the year at once and then immediately convert, correct? I get why you make the conversion immediately (to avoid any gains that would trigger taxes when converting), but what if you don’t have the total amount at once – could one contribute and immediately convert multiple times with smaller amounts throughout the year? Also, do you know offhand if Vanguard now allows IRA to 401(k) transfers?